However, Chapter two saw the resumption of the battle royal between Team P&B (Jasper Barnham/Ollie Wells) Wonkey Donkey (Mark Watts/Kathy Sherratt (Watts) (standing in for Bish) and Team GUL/North Sails (Mark Barnes/ Amir Shamuddin (standing in for Char). To add spice Torq (Gerry Fermor/Leakey Fermor) light airs specialists were in the mix. Day 1 was all about the strong tide and shingle beach. The course was set in a SE force 2 – 3 and easterly tide. Russian roulette and holding one’s nerve would be a good way to put it. Over the first two races, places changed a lot both upwind and downwind with B14s skimming the shoreline with slightly raised boards. Go offshore and you lost places. All teams touched to varying degrees as did several RS800s. Wonkey Donkey in race 2 shook a leg and hit a rise hard, damaging their board and chipping their nice new B14. Alas end of race 2 and the 3 legged donkey, after capsize inspection retired to the grazing to be had ashore, not to be seen again over the weekend. GBR 789 (Henry Metcalfe/Jasmin Husband) also hit hard and bailed out with a capsize to save the kit which must have surprised the spectators but other than that, they held onto the coat tails of Torq, P&B and GUL/North Sails who battled throughout with little to chose at times. GUL/North Sails Held the lead by a nags head overnight from Torq and P&B not far behind. The classic fleet also fought their own battle between White Cover/GUL (Alex Horlock/Tim Pearce) and White Stilletto (Liam Willis/Abby Keightley-Hanson) with one point gap overnight. Throughout the fleet there were battles with some new faces attending their first B14 TT. Sunday dawned bacon butties were consumed and more of the same once the breeze set in. Jousting commenced, and the runners and riders hit the shore in the westerly tide and SE force 2-3. As race 4 closed out it came down to a resurging GUL/North Sails doing a crash gybe drop with P&B a nose ahead, then the sprint to the finish with kites gathered on both teams crew’s laps, both driving hard. P&B got it by less than 0.5 m. More was to follow, with hopefully Torq not mounting the windward mark again as she was swept onto the mark in race 4. In the fading breeze, Mike the R/O and his team called it time before the breeze completely died and all retired to a well earned lunch and cold drinks. So another nice sunny weekend and close racing with quick turn arounds and good catering ashore with Dan and co as the ring masters on Saturday night, and to GUL for the tokens that the fleet appreciate. The Merit prize went to James and Anne Gardener. After a couple of the steeds including Wonkey Donkey have been refreshed by Solent Boatworks, they’ll be on their way to Porthpean for round 3 over the bank holiday 29.04.2017 to experience great Cornish hospitality. 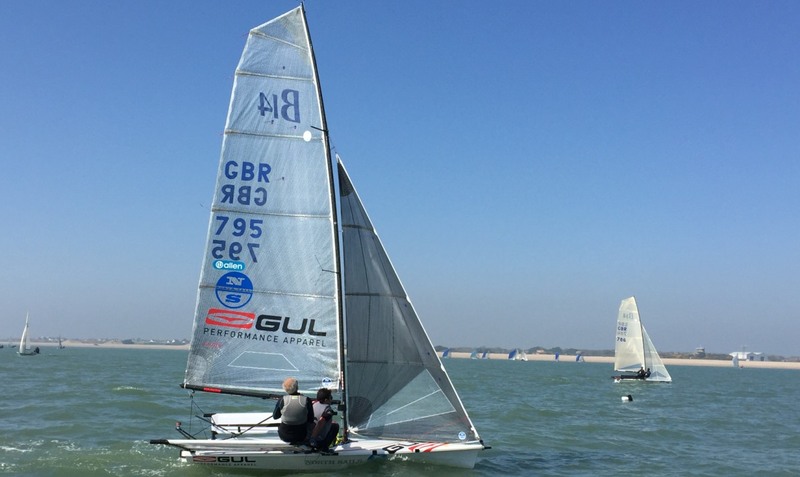 Those looking to training, there will be training events going on in May with the first at Whitstable Yacht Club on the 5 – 6 May. So if wanting to be included, you need to let the class know ASAP.